How fast can BT get with its fibre? Pretty darn fast if the company’s latest trial is anything to go by, with speeds of 40Gbps having been achieved. 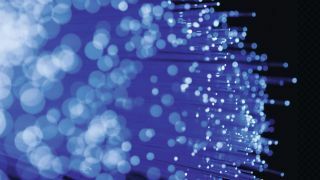 BT hooked up with Huawei to test out new broadband tech in what it called a European first, with an FTTP (fibre-to-the-premises) connection running between BT’s R&D centre at Adastral Park and the University of Suffolk seeing 40Gbps (‘NG-PON2’ tech), 10Gbps (‘XGS-PON’) and 2.5Gbps (‘GPON’) speeds being delivered simultaneously over one fibre cable. The company notes that currently FTTP delivers speeds of up to 330Mbps using a single fibre that transmits 2.5Gbps of capacity, which is subsequently shared between subscribers. With the new technologies being tested here, all use separate wavelengths allowing them to coexist happily on the same line, meaning 40Gbps and 10Gbps can be piped down the same cable to allow for much greater potential FTTP speeds. BT says this means its broadband infrastructure is effectively future-proofed against the sort of increased bandwidth demands (from things like 4K video) we can expect down the line. Clive Selley, CEO of Openreach, commented: “The trial proves that not only is our FTTP network fit for the future, but with the right equipment in the customer’s home and at the exchange, we can tailor speeds to suit their individual requirements. Selley further noted that BT will have hooked up some 12 million premises in the UK to ultra-fast speeds – using FTTP and G.fast – by the end of 2020, with the majority of the country getting coverage by 2025. G.fast tech effectively supercharges current FTTC (fibre to street cabinet) connections, boasting speeds of up to 300Mbps which is expected to increase to 500Mbps as the rollout progresses. Although if you’re a long way from your cabinet, you may not get such a spectacular boost, as G.fast will still be affected by the length of phone line it’s running across (as current FTTC connections are).